FREE VALUATION. To buy, auction, sell or consign your Michael Golden art that is for sale, please email Nate@NateDSanders.com or call the Nate D. Sanders Auction House (http://www.NateDSanders.com) office at (310) 440-2982. Michael Golden is an artist who began his comics career by working on titles such as Mister Miracle and Batman Family for DC Comics. He is best-known for his work on The Micronauts for Marvel comics and also co-created the character Rogue, who debuted as a villain in The Avengers Annual #10 in 1981. Golden also worked as a DC Comics editor and Senior Art Director for Marvel. Two-page “Avengers” artwork signed by artist Michael Golden, who also draws a large sketch on the verso, captained “I am Frank Robbins Father” a tongue-in-cheek reference to the famous comic artist. Artwork appeared in the Super Spider-Man #226 issue as a lead-in for the “Avengers” #115 reprint that was published only in the United Kingdom in 1977. Large splash page features Captain America, Thor, Vision and Scarlet Witch, drawn on Marvel Comics illustration board, with lettering glued on. Small amount of soiling, overall in very good plus condition. 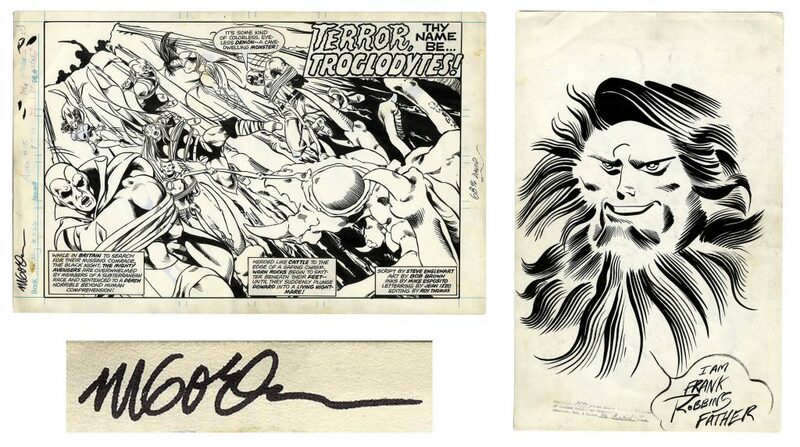 Marvel Comics Group copyright stamp to verso and catalogue information along top margin. Sold for $1,300. “Avengers” Original Art From 1977 Signed by the Artist Michael Golden— Splash Page With Additional Large Sketch by Golden on Verso﻿. Click to enlarge. Please let us know if you have Michael Golden art that is for sale. Top dollar obtained for your Michael Golden art.